The research of the Energy Vulnerability Modeling Project has concluded that the oil stockpile premium probably lies in the range of $20 to $40 per barrel, and the oil import reduction premium in the range of $5 to $20 per barrel.ENERGY POLICY VS. OIL POLICYSince the price of oil Btu's is three to four times the price of coal Btu's, energy Btu's are definitely "not created equal." If an oil import reduction premium of $5 to $20 is added on top of the price of domestic oil, the inequality grows much larger. Forum - Energy Security and Economic Performance of the Caspian Region: How Vulnerable is the Region to the Falling Oil Price? 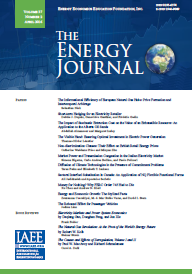 Proceedings - Oil Import Dependency: "Wolf at the Door" or "Peter and the Wolf"
Published in Volume 2, Number 2 of The Quarterly Journal of the IAEE's Energy Economics Education Foundation.